Iceberg lettuce can be a crisp, refreshing addition to salads or sandwiches, though its nutritional content pales next to its dark-green relatives. Darker lettuces like romaine and red leaf are richer in vitamin A, beta-carotene and other nutrients than iceberg. Iceberg offers a low-calorie source of dietary fiber, mostly in the spine and ribs of the lettuce head. Iceberg also provides small to moderate amounts of potassium, manganese, folate, iron and several essential vitamins. Vitamin K is iceberg lettuce's most significant nutritional offering. According to the U.S. Department of Agriculture's nutritional data, 1 cup of loosely packed, shredded iceberg lettuce contains 13.7 mcg of vitamin K, a generous portion of recommended 75 to 90 mcg for adults over age 19. This fat-soluble vitamin is crucial for blood clotting and for binding calcium to bones, a process that maintains bone density. Vitamin A and its precursor beta-carotene play a vital role in maintaining the health of your eyes, skin and skeletal tissue. Together these nutrients promote the health of the skin and mucosal cells that act as a barrier against pathogens and prevent infection. A cup of shredded iceberg lettuce contains 286 IU of vitamin A, a fat-soluble vitamin. Iceberg lettuce contains small amounts of beta-carotene, the antioxidant compound that gives dark green lettuces like romaine a richer hue. A cup of iceberg lettuce provides 2 mg of vitamin C, an antioxidant that supports your immune system, promotes wound healing, helps your body absorb iron and contributes to the formation of bones and cartilage. Because your body flushes away excess amounts of this water-soluble vitamin in your urine, adults should fill their requirement of 75 to 90 mg through food sources or supplements every day, advises the University of Maryland Medical Center. Producing red blood cells and antibodies are two functions of vitamin B6, a water-soluble vitamin. B6 also helps your body with protein metabolism and healthy nerve function. 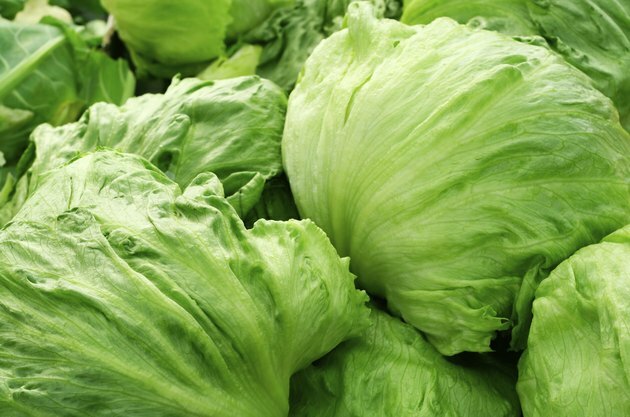 Although iceberg lettuce's offering of 0.035 mg of vitamin B6 per cup may seem low, the Institute of Medicine's recommended daily amount for adults is only 1.2 to 1.7 mg, depending on your age and gender.